It’s difficult to conjure up a February-appropriate plant that we haven’t previously profiled. 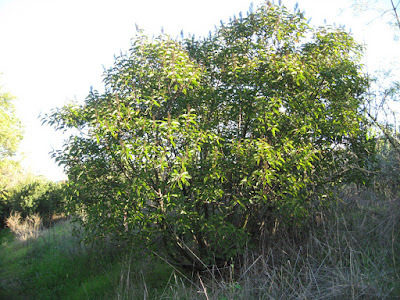 But one that’s getting to a reasonable size is the Western chokecherry, Prunus virginiana var. demissa, in Mother Nature’s Garden of Health. The scientific name is pronounced: PROO-nus ver-jin-ee-AN-uh dee-MISS-uh. Prunus virginiana is native to North America. 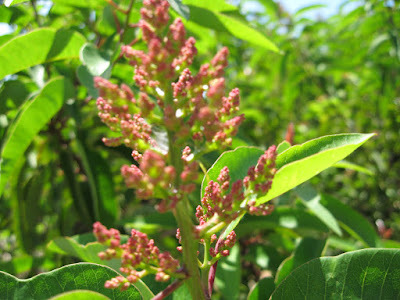 It once grew wild in much of Canada, the United States and northern Mexico. There are two recognized varieties: Prunus virginiana var. 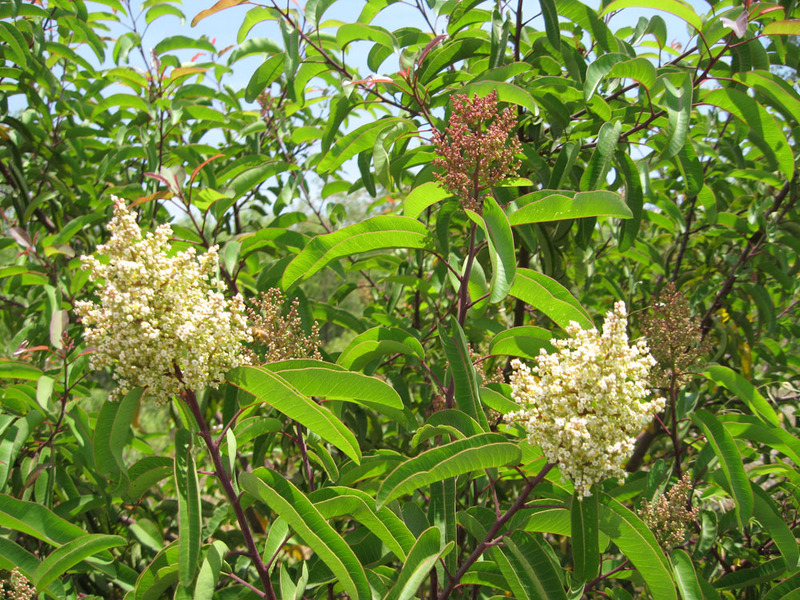 virginiana (the eastern chokecherry, native to the eastern US and Canada); and Prunus virginiana var. 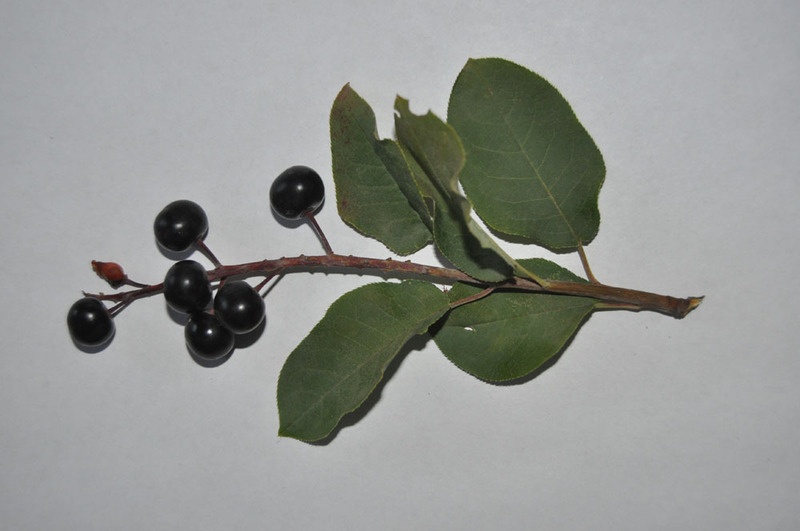 demissa (the western chokecherry, native from WA, OR and CA east to the Rockies and Mid-West). In California, Western chokecherry grows in many wooded and shrubby habitats from San Diego County to the Oregon border, at elevations below about 8000-10,000 ft. (2500 m.). 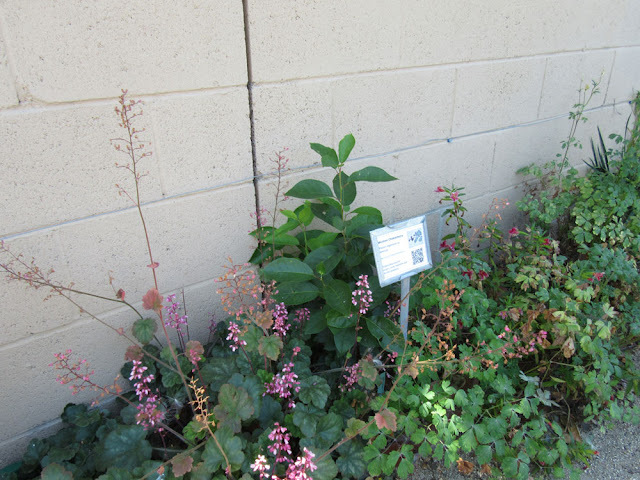 It’s not native to either the Southern California coast or the Central Valley, and grows mostly in areas with winter snow, or near seeps and stream bottoms. In Los Angeles County, it can still be seen in the Liebre and San Gabriel Mountains – and in gardens. It grows in most foothill and mountain plant communities, especially scrub lands, oak/pine woodlands and coniferous forests. 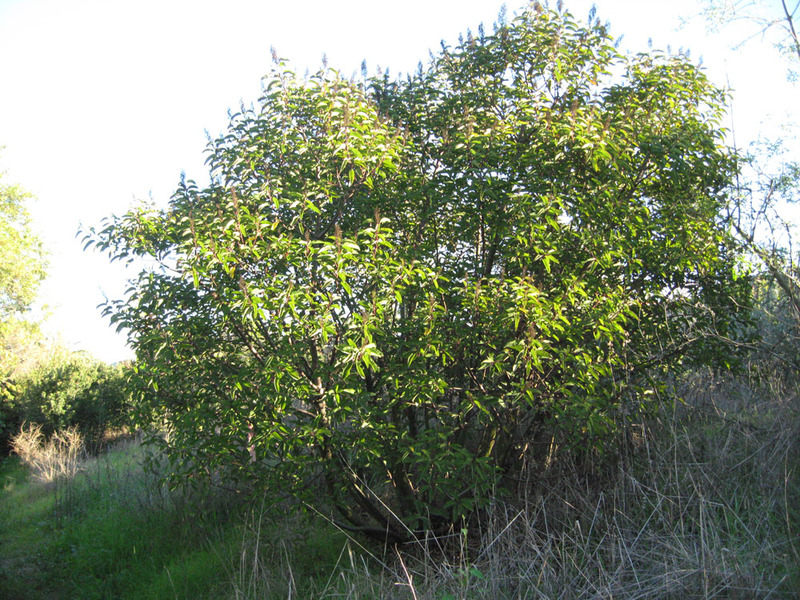 Prunus virginiana is a large shrub or small tree. 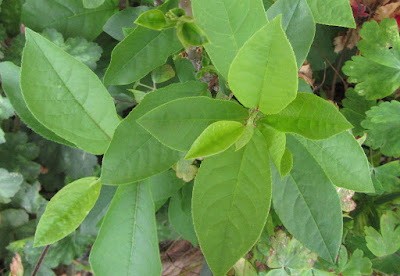 It varies greatly in size and form, sometimes appearing as a 3-4 ft. shrub. In other sites, it can achieve mature heights of 20-30 ft. (6-9 meters). Its mature spread can be 15-20 ft. The overall form is erect, with many slender branches. The bark is reddish on new growth, becoming gray. 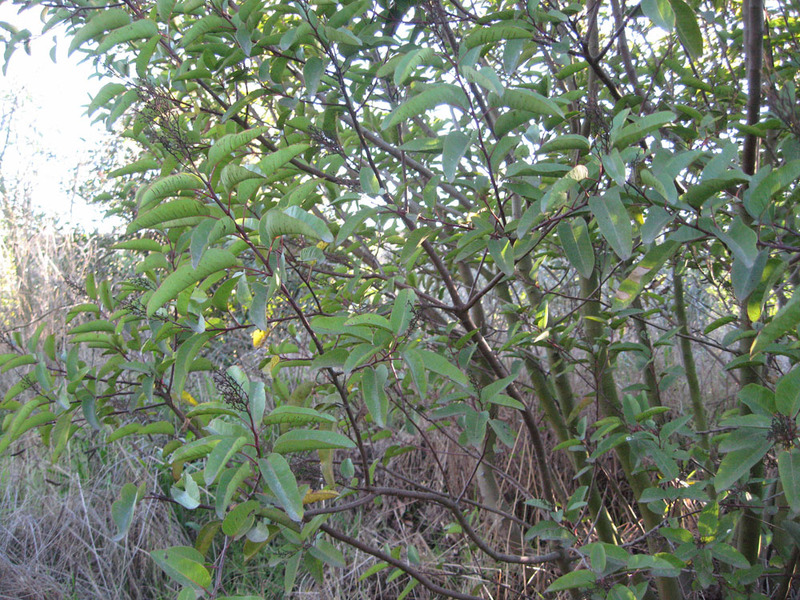 Some plants are shrub-like, with much branching from the base. Others are more tree-like, with a central leader. In some situations, Chokecherries form dense thickets. This characteristic makes them particularly suitable for hedgerows and screens. For more photos of Chokecherry plants see reference 1, below. Chokecherries are winter-deciduous, losing all their leaves in late fall in colder climates. In cold climates, leaves turn an attractive gold or orange in fall, making them a good source of fall color. In warmer sites (like Mother Nature’s Garden of Health), plants may retain their leaves well into winter in some years. The leaves are simple, ovate to elliptical, with finely-toothed margins. The new leaves are bright green in spring, maturing to medium or dark green above and slightly paler green beneath. The leaves contrast pleasantly with the bark, which is smooth and dark red on younger twigs and often gray on mature branches. The foliage is a larval food source for Small-eyed Sphinx Moth & Columbia Silk Moth. 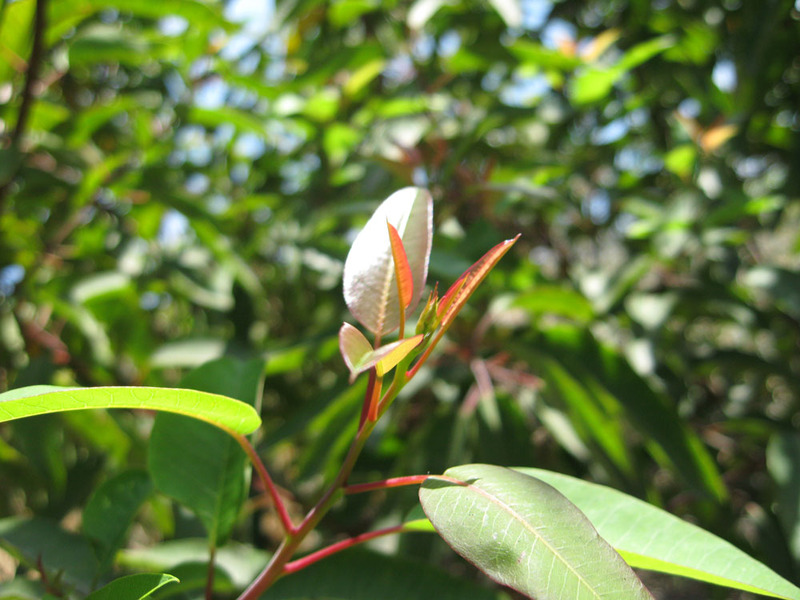 Like many members of the genus Prunus, parts of the plant are toxic. New growth, wilted leaves, or plant parts injured by frost or drought are particularly harmful if ingested by humans or animals. Domestic cattle and sheep have been poisoned eating too much foliage. 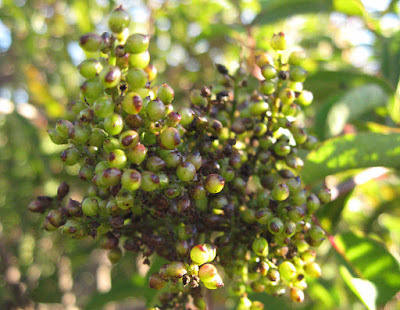 Despite this, Chokecherries are widely used as a forage plant in wild. Animals as varied as bears, moose, coyotes, bighorn sheep, pronghorn, elk, deer and smaller mammals all browse Chokecherry. Chokecherry flowers have many characteristics typical of the genus Prunus. The flowers themselves are small, white to cream-colored, with five simple petals (flower parts in fives). 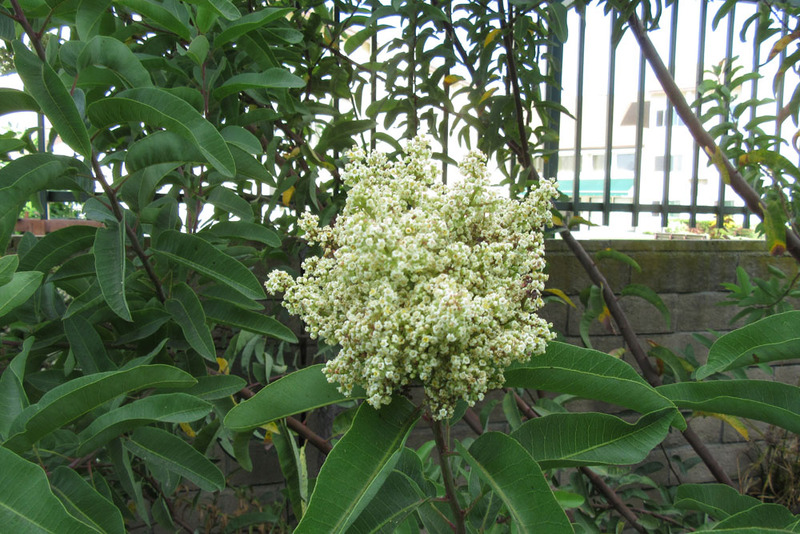 The flowers are arranged along drooping, 2-5 inch flowering stalks, and may be densely packed. Plants are very showy in bloom, and the species is often used as an ornamental shrub/tree in home landscapes. 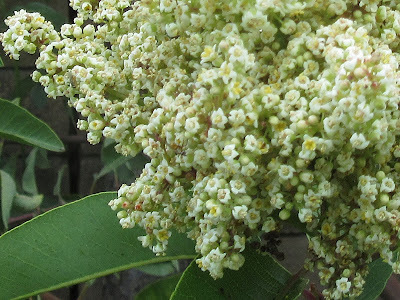 The flowers are sweetly scented – with a slight hint of almond – and attract a wide range of pollinators, including native bees and butterflies. Chokecherry is probably best known for its fruits. The fruits are small (1/4 to ½ inch), shiny ‘cherries’ that begin green, then ripen to either red, dark-red or almost black (Four Corners States; Rockies). Even when ripe, the raw fruits are very bitter, hence the common name ‘Chokecherry’. None-the-less, birds and animals relish the fruits. If you grow Chokecherry for its fruit, you may need to protect the ripe fruits from hungry birds! The seeds (pits) contain high concentrations of hydrogen cyanide, a potent poison. Fruits should not be eaten raw; however they can be cooked to render the fruit non-toxic, particularly when the seeds (pits) are removed after cooking. 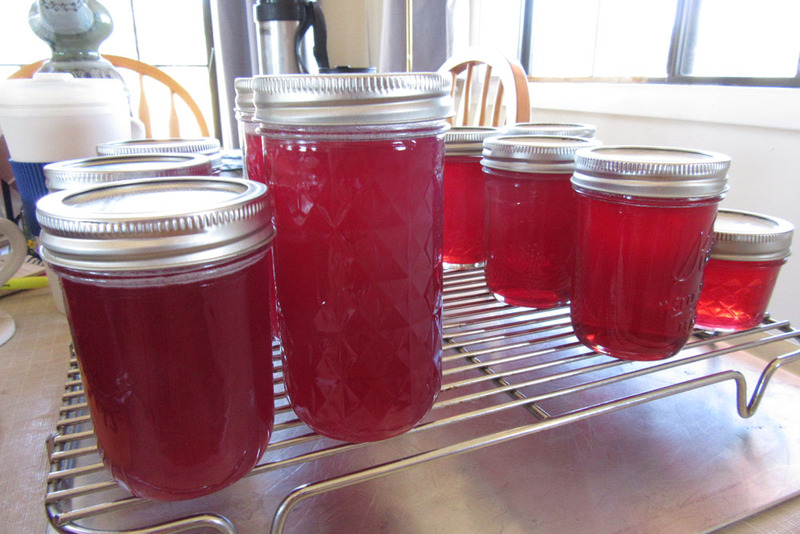 Chokecherry jelly and syrup are highly prized for their color and cherry flavor. They are one of the favorites at garden gourmet events in our gardens. Chokecherries can be grown in all but the heaviest clay soils. They don’t do well in soils with pH > about 7.8. They are shade tolerant and do well in part-shade and under trees. While they can be grown in full sun (with adequate water), they are probably most successful when given afternoon shade in Southern California. Chokecherries like a richer soil than many of our local natives. Organic mulch can be used to supply nutrients – or fertilize with a low-dose fertilizer in spring. Chokecherries also need some summer water. They have some deep roots, but also many shallow roots. In the lowlands of Southern California, they likely will need water every 2-3 weeks from June through September. We water our Prunus virginiana every other week in Mother Nature’s Garden of Health. The soil dries out between waterings in our clay-loam soil. 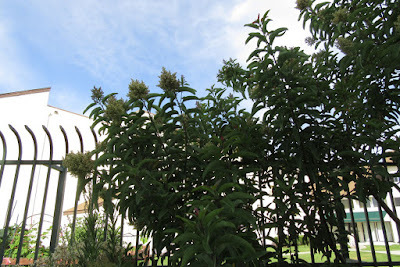 We’ve also located our plant on the north side of a tall wall, providing more shade than in most of our garden. 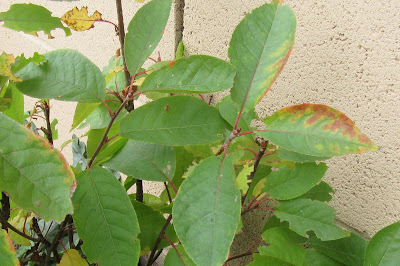 Like most Prunus (plums, cherries, peaches, nectarines, apricots, almonds) Prunus virginiana is susceptible to black knot fungus, fireblight, and several other diseases. In general – and with judicious watering – it is healthier then the domesticated Prunus. 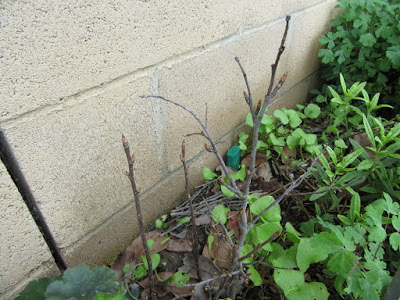 But keep an eye out for disease, and prune out diseased wood right away (using sterile pruners). Western chokecherry has a pleasant natural shape. Unless you’re training your Chokecherry to a tree or espalier it won’t need much pruning. But you will need to prune off the root suckers, which can be common in this species. If you’re in the market for a large shrub/small tree Prunus virginiana has much to recommend it. It can be used in a mixed hedgerow or pruned up as a shade tree. 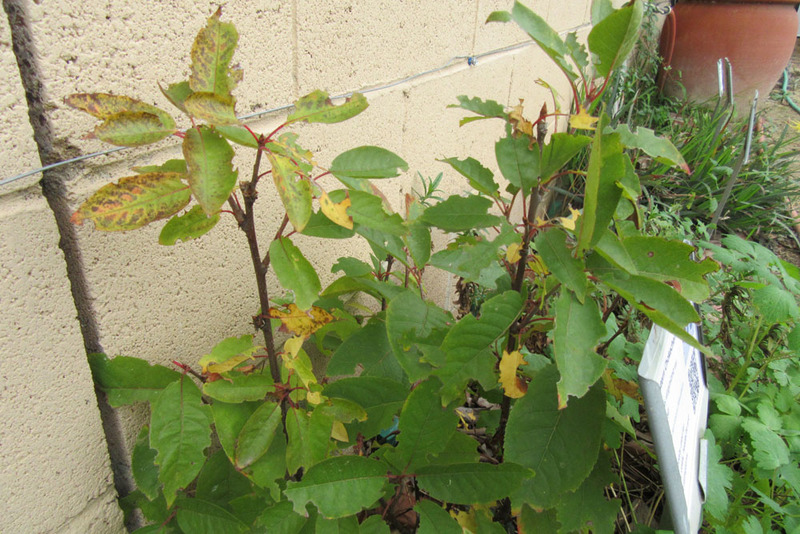 In our garden, we are espaliering our Chokecherry along a wall (most Prunus are good candidates for espalier). The foliage is pleasant and the flowers are showy and fragrant. The fruits can be used to make delectable jelly, syrup, fruit leathers, cordials and wine – or left as habitat for fruit-eating birds. Traditional medicine used tea made from the bark for stomach ailments, coughs, colds and diarrhea, and as a sedative. The ‘tea’, as well as a poultice made from the leaves, was used to treat cuts, sores, bruises. Dried, powdered bark was used similarly. The ripe fruit is a laxative. 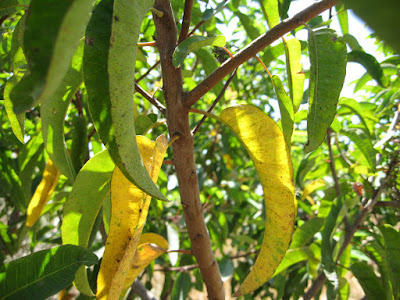 And leaves, bark and fruits can be used as natural dyes. 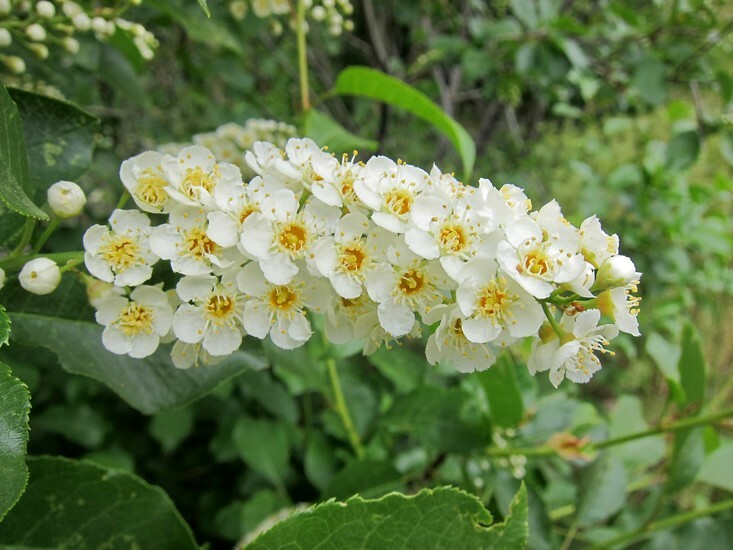 In short, Western Chokecherry is an attractive shrub/tree with many uses. It’s one of those native plants that provides lots of value for its cost – and the space it takes in a garden. 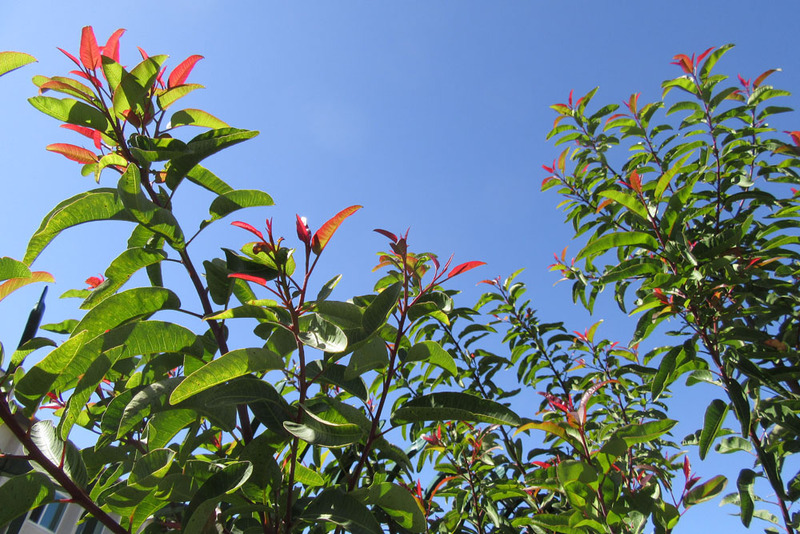 If you need a large shrub or small tree, Prunus virginiana may be right for your garden. 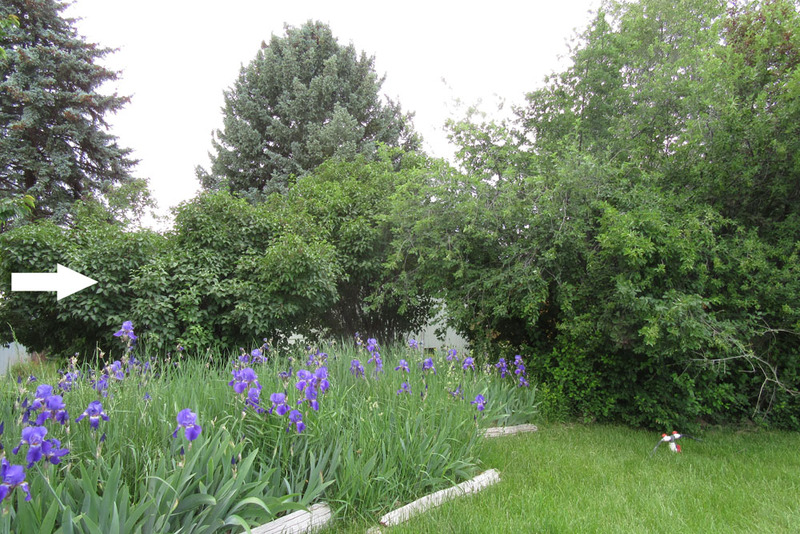 Limited gardening space requires thoughtful plant choices. Good plants for smaller gardens combine beauty, usefulness and habitat value; what we like to think of as ‘value added’ plants. Some of the best evergreen habitat plants are the native live oaks. They are also attractive and provide food (for those willing to process the acorns). And fortunately, several local live oaks are small enough to be considered for suburban gardens. One of our favorites is Quercus berberidifolia. The scientific name is pronounced: KWER-kus ber-ber-id-i-FO-lee-uh. California is blessed with twenty-one species of native oaks. 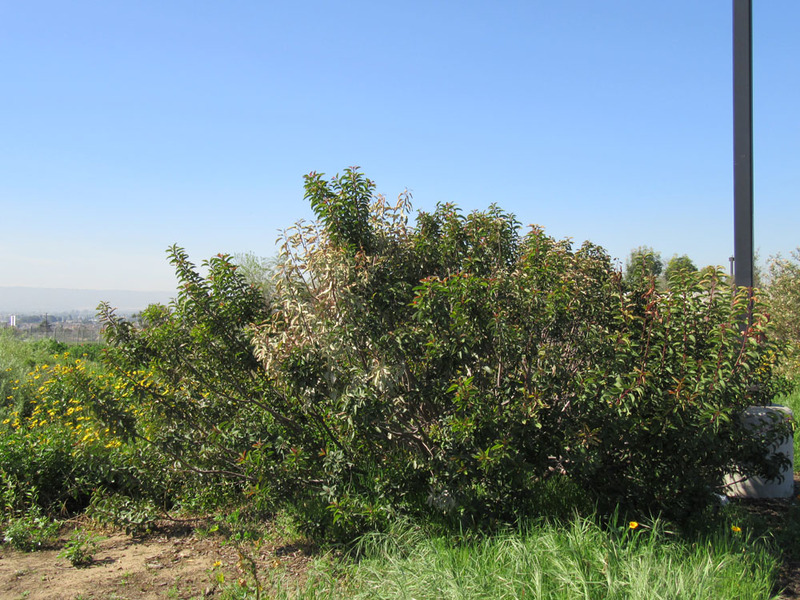 Of these, sixteen are native to Los Angeles County – a remarkable amount of oak biodiversity. The Southern California oaks are mostly evergreen (thirteen of sixteen species). And of the evergreens, only five (Quercus agrifolia; Q. chrysolepis; Q. engelmannii; Q. tomentella; Q. wislizeni) are large trees. The rest are large shrubs or small trees, of a size suitable for smaller landscapes. 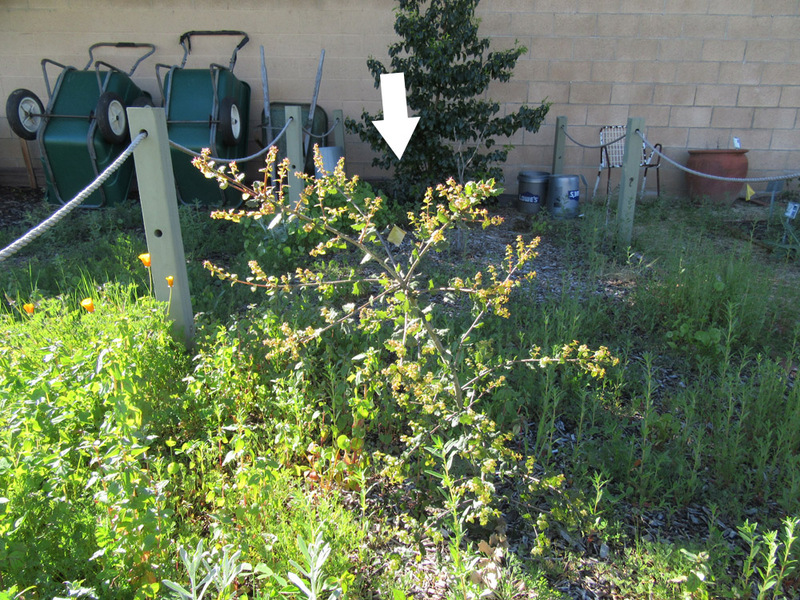 Among the smaller S. California live oaks, Quercus berberidifolia and Quercus dumosa (Nuttall’s scrub oak) are most widely available in the nursery trade. 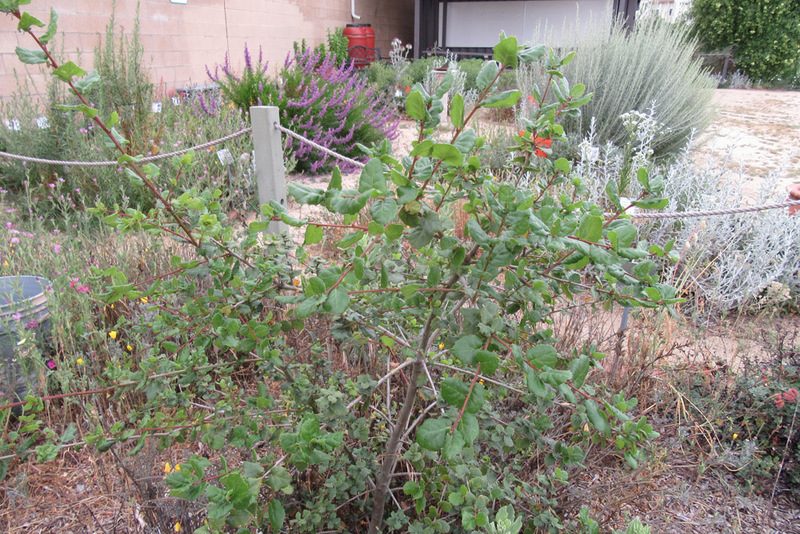 Like most oaks, the scrub oaks of California are prone to hybridization, producing a number of hybrid forms. It’s likely that some plants available for purchase are actually hybrids. And there’s still considerable debate about the range and characteristic morphology of these two species. The interested reader is directed to references 1-6, below, for more on this evolving topic. Quercus berberidifolia is known by several common names: Inland Scrub Oak; California scrub oak; Scrub oak. It belongs to the Family Fagaceae (the Beech Family) and is a member of the White Oak section of the genus Quercus. 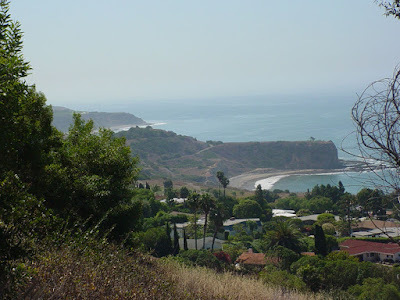 Its range extends from the Northern California coastal foothills to Baja California, Mexico. 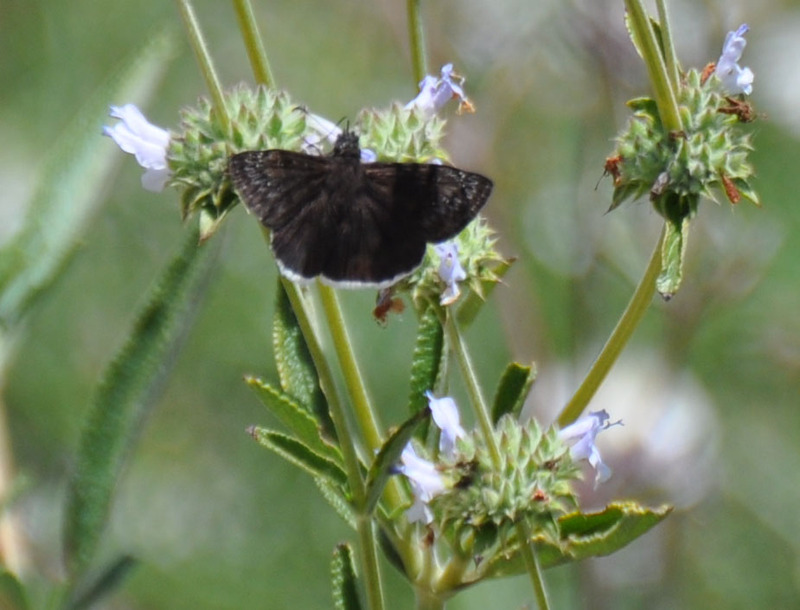 In Los Angeles County, it can be found in the Santa Monica and Verdugo Mountains and the foothills of the San Gabriel Range, below about 5000 ft. elevation. 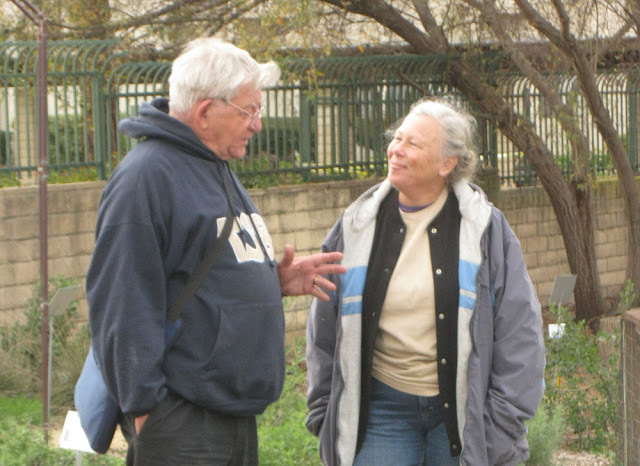 It is most commonly associated with the chaparral plant community. The California scrub oak is a small, evergreen or semi-evergreen shrubby oak. When young, it has a somewhat scraggly appearance (above). With age, it develops its characteristic mounded form. It typically grows no taller than about 9-10 ft. (to 3 meters), but may grow 15+ ft. in prime locations. It often is slightly wider than tall: usually 15-20+ ft. wide. It has light green-gray to gray, smooth bark. 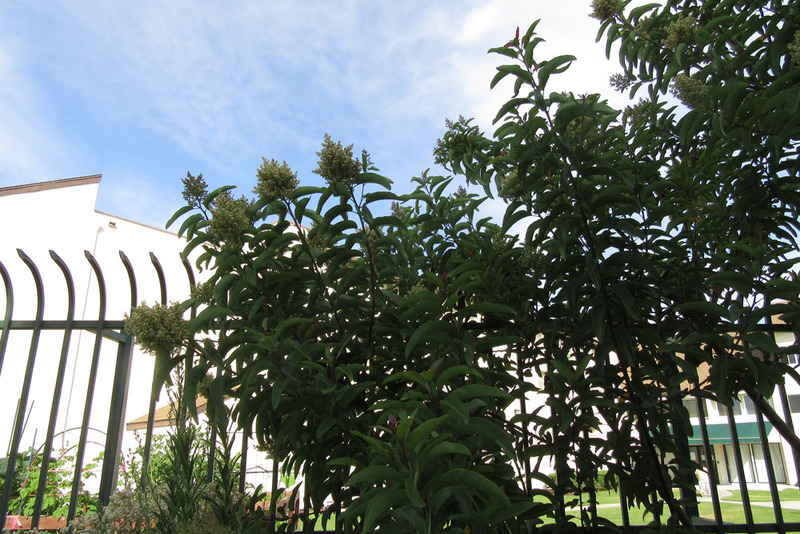 The foliage is dense, making this a good screening shrub. The reader is directed to references 7-9, below, for more photos. 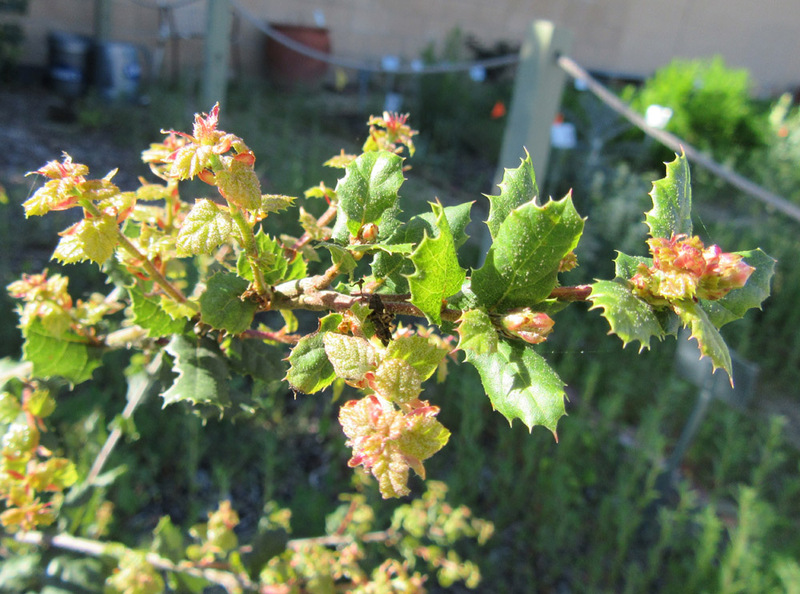 Quercus berberidifolia is a slow growing plant, adding 1-2 ft. of new growth each year. It’s also long-lived in the wilds – likely several hundred years. It’s often difficult to tell the precise age of oaks that grow in fire-prone areas. Like many local oaks, Quercus berberidifolia re-sprouts after a fire. So the age of individual stems may be significantly less than the actual age of the plant. For more on the fire-relations of this species, see reference 10. Quercus berberidifolia has small, often holly-like leaves – hence the scientific name. The leaves are thick, stiff and shiny to dull above. The undersides of the leaves have sparse hairs (trichomes). The shape of leaves can vary tremendously, even on a single plant (see references 9 and 11 for examples). Like all oaks, Quercus berberidifolia is wind pollinated. 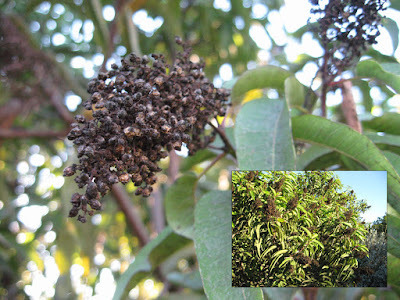 The separate male and female flowers occur on the same tree. Plants bloom in winter or early spring – usually February or March at lower elevations. The male flowers, with their yellow pollen, grow on dangling, one-inch catkins. The pollen is not usually a problem for human allergy sufferers. The female flowers are often hidden by leaves. The acorns, which develop from the female flowers, are broad and chunky. They look distinctively different from the longer, tapered acorns of the Coast live oak (Quercus agrifolia) and Quercus dumosa. Acorns ripen 6-8 months after pollination. New seedlings can be started quite easily from fresh acorns in the fall. 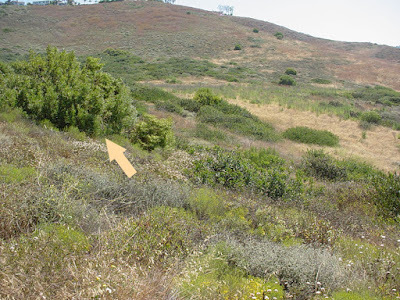 California scrub oak likes a site with full sun to part-shade. It grows in most well-drained local soils except those with high salinity (no recycled water). It can succeed in clays and clay-loams, as long as summer water is kept to a minimum. In soils with reasonable drainage, it can be deeply watered every 4-6 weeks during the dry season. The first 4-5 years, when plants are establishing, they require monthly water in most locales. 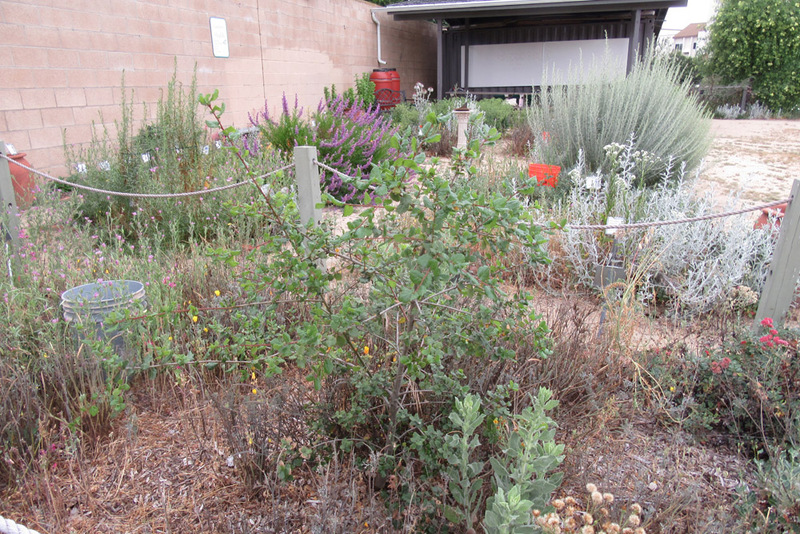 Then plants are quite drought tolerant. This species has deep roots that require a few years to develop. It’s best to let oak trees self-mulch, and Quercus berberidifolia is no exception. Oak leaves help with soil moisture retention. They also contain plant chemicals that likely provide protection from pests and diseases. The leaves also repel slugs, snails and grubs. So, leave the leaves in place when they fall. 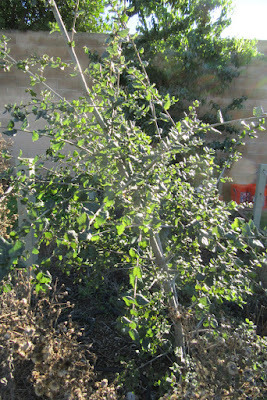 California scrub oak is generally easy to grow. It is susceptible to several oak pests, including several types of borers, and to soil and other fungal diseases. For an excellent guide to the pests and diseases of California oaks see reference 12. 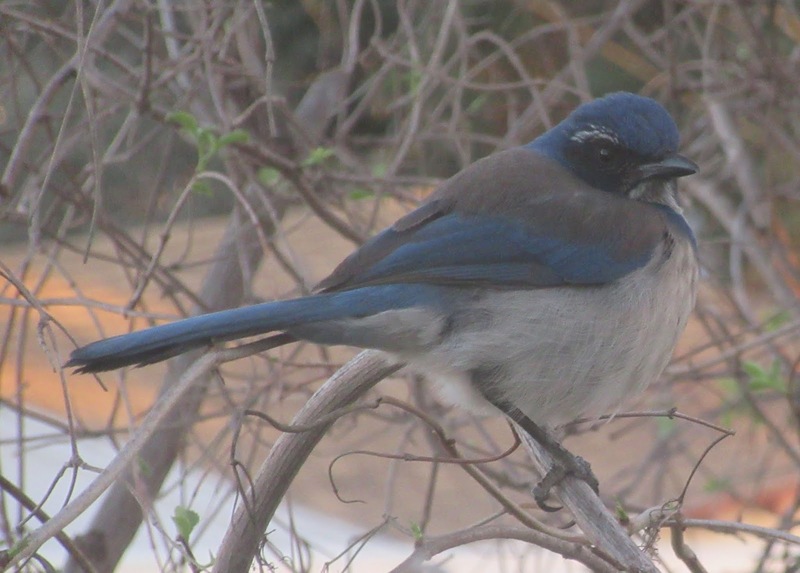 Scrub jays and others love acorns! 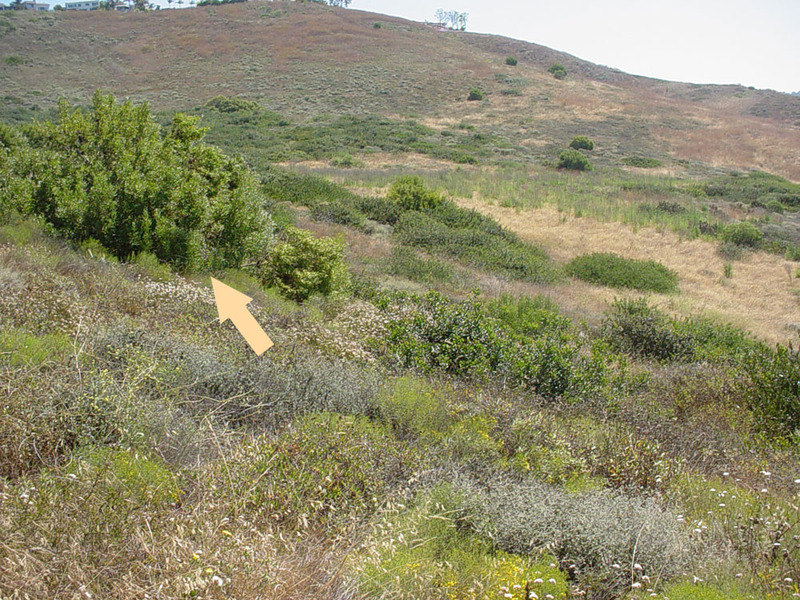 The California scrub oak is an excellent habitat plant. The dense foliage provides cover and nesting sites for birds. The shade and cover are utilized by smaller, ground dwelling animals from rabbits to lizards and doves. The acorns are a favorite food of Jays, woodpeckers, squirrels and other animals. In the wilds, young foliage is sometimes browsed by larger animals (deer, sheep, bears). Oaks in general provide important habitat for a wide range of beneficial insects. These, in turn, attract the insect-eating birds. Butterflies for which this oak provides larval food include the California Sister, Propertius Duskywing, Mournful Duskywing, Golden Hairstreak, and Gold-Hunter's Hairstreak. The acorns of Quercus berberidifolia are edible, though not as tasty as those of other native oaks, particularly the Black oaks. Acorns must be leached of their bitter tannins – an involved process – before being useful as acorn meal. The galls that grow on oak trees are strongly astringent and were traditionally used in the treatment of bleeding and chronic diarrhea. 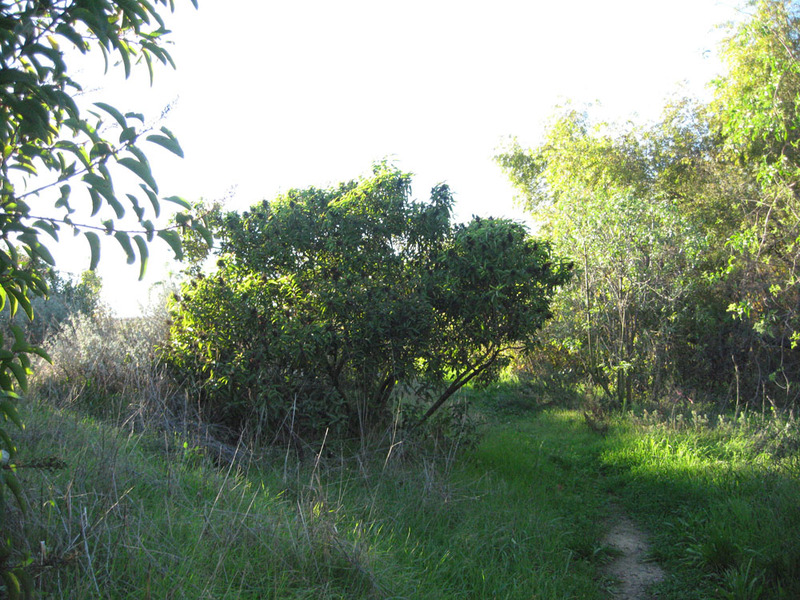 In summary, native scrub oaks can be useful evergreen shrubs or small trees in suburban landscapes. 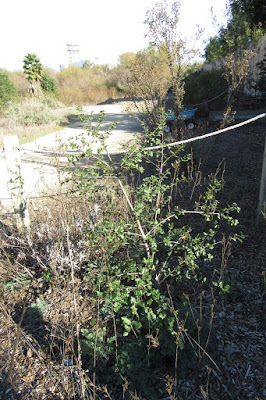 They can be used as background shrubs, for large hedges/hedgerows or pruned up as small shade trees. They grow well on slopes, with a minimum of care once established. They can be planted in dry parking strips and can even be used as bonsai or container plants. They can be shaped or left to develop their own natural form. They are resilient and water-wise. Oaks also have much to recommend them as representatives of our California heritage. They bring many types of wildlife to the garden and even provide a source of human food. They recall a time when oaks were key to human survival. They are among our most important native plants and their habitat is disappearing in some areas. 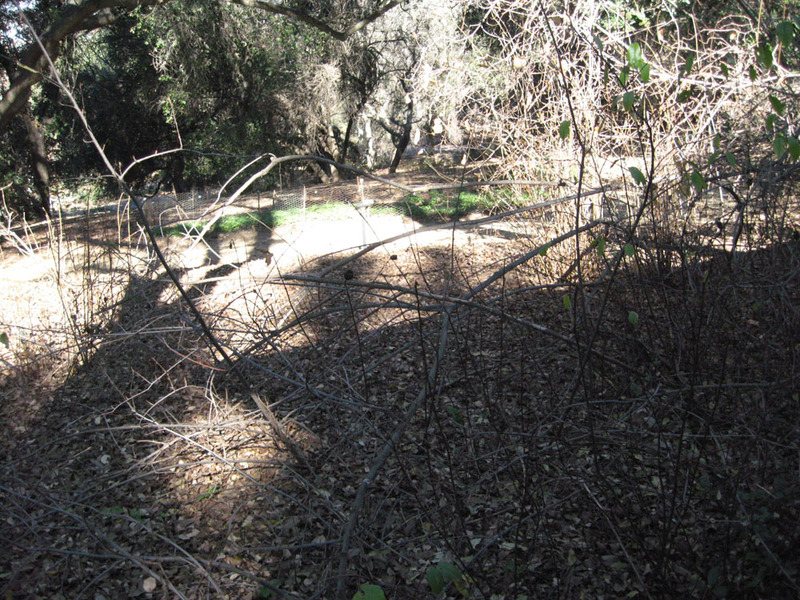 That’s why Los Angeles County oaks are protected by The Los Angeles County Oak Tree Ordinance. 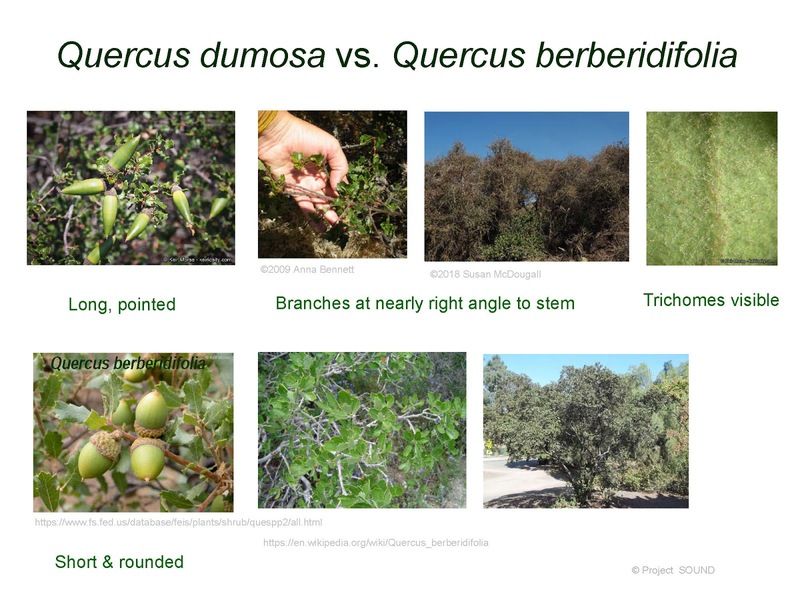 And these are just a few reasons to plant Quercus berberidifolia in your own garden.